NOTICE: Private Dolphin Swims can only be booked by calling Dolphin Swim Tours at (866) 577-0261 . Vacations are always better when you share them with someone special. A private excursion with your soulmate, best friend, close family member, or new love interest will heighten your experience in Puerto Vallarta. With the resort town's location along the Pacific coast, you have access to some of the friendliest bottlenose dolphins in the world. Just book your private swim for two and get to know these adorable marine mammals in person. Your customized tour will begin with a detailed orientation from one of the Nuevo Vallarta Dolphin Center's expert trainers. 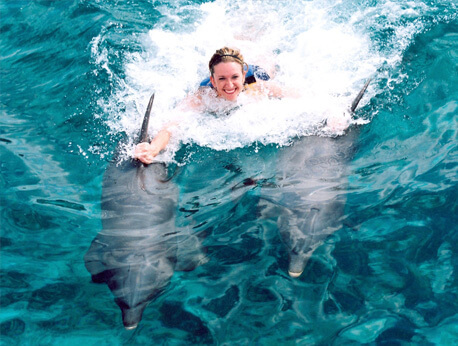 Then you and your friend will be ready for interaction with the animals through either belly rides, foot pushes, dolphin kisses, or some other form of bonding. As you make your memories, our professional photographers will be nearby to document your every move. You'll be able to go home with all your memories in one big package to show to the rest of your loved ones. The choices are yours. Simply pick the person with whom you'd most like to share this experience and then decide how to plan your private dolphin encounter. Our highly talented group of dolphin trainers are among Mexico's finest, and you'll come away with increased knowledge about these intelligent oceanic creatures. Additionally, you'll be familiar with the sleek, rubbery feel of a dolphin's skin and the sound of its unique clicks, whistles, and squeaks. Towels and life jackets are provided; just show up in your swimsuit and be prepared for the time of your life. Don't hesitate to sign up for this one-of-a-kind adventure. It makes the perfect gift for your loved one or friend. You may wish to book the tour for a honeymoon, a family vacation, or even a business trip. Regardless of the occasion, a private dolphin swim for two is the ideal expedition for venturesome souls.